For many years, Panama's General Manuel Noriega was the embodiment of the terms "military strongman" and "de facto leader". Although he was never the actual president of Panama, he was the key figure from 1983 to 1989 - and a key US ally in Central America for four decades. His connection with the United States dated back to the 1950s, when according to various accounts, he was recruited as a CIA informant while studying at a military academy in Peru. Noriega, now 77, eventually became a prized American "asset" in a region that was becoming politically hostile to US interests in the wake of the Cuban Revolution. He rose within the ranks of the Panamanian armed forces to become a key supporter of Gen Omar Torrijos, the military ruler who signed a treaty with the US to restore the Panama Canal zone to Panamanian sovereignty in 1977. After Gen Torrijos's death in a mysterious plane crash in 1981, Noriega became the power behind the scenes as head of the security services. The US relied on Panama as a regional listening post and Noriega obliged with unfaltering support for the Contras in Nicaragua, and in the fight against the FMLN guerrillas in El Salvador. At the same time, he began to play an increasingly repressive role internally in Panama, especially after the assassination of Hugo Spadafora, a political opponent who was found beheaded in 1985. 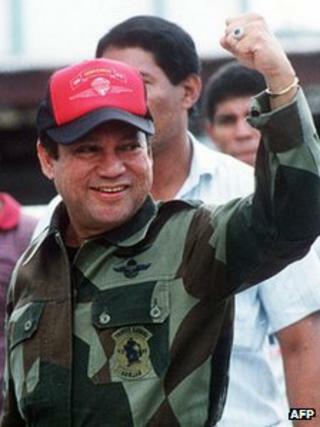 Noriega allegedly played a role in the mid-1980s Iran-Contra affair, which involved the smuggling of weapons and drugs to aid US undercover efforts to support the anti-government forces opposing the Sandinistas in Nicaragua. However, the US became increasingly suspicious of Noriega amid indications that he was selling his services to other intelligence bodies, not to mention drug-trafficking organisations. These tensions became public in 1988 when Noriega was indicted in a US federal court on drug-trafficking charges. He was also accused of rigging elections in 1989. By mid-December that year, ties had deteriorated so far that President George H W Bush launched an invasion, ostensibly because a US marine had been killed in Panama City, although the operation had been months in the planning. Noriega sought refuge in the Vatican's diplomatic mission in Panama City. The US tactic to flush him out was to play deafening pop and heavy metal music non-stop outside the building. By 3 January 1990, it had worked and Noriega surrendered. He was flown to the US with prisoner of war status to face charges of drug-trafficking, money-laundering and racketeering. His trial there was an international spectacle that revealed titillating details of his personal life. At the time it was said he wore red underwear to ward off the "evil eye". In 2007, he concluded his sentence after 17 years of confinement and public silence in a Miami federal jail. But his legal troubles were far from over and he remained in custody. In 1999, Noriega had been convicted in absentia in France of using $3m in proceeds from Colombia's Medellin drug cartel drug trade to buy property there. In March 2010, the US Supreme Court agreed to a French request extradite him to Paris, where he faced a new trial for money-laundering. Noriega, who denied the charges, was found guilty and sentenced to seven years. His legal odyssey took another turn on 23 November when a French court approved a request from Panama to send him back home, where he was convicted in absentia of murder, corruption and embezzlement. He refused the chance to appeal the decision and flew out of Paris on 11 December, escorted by a team of Panamanian officials and a doctor.